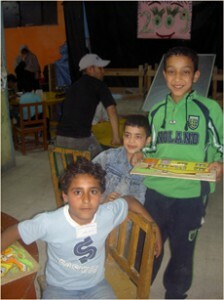 This organization assists working children (mainly boys) from garbage collectors’ communities in Moqattam. In this area, often called “garbage city,” families survive by collecting, sorting and recycling about 95 percent of Cairo’s trash. About 80 percent of this work is done by hand. Children actively participate in this work, and most of them drop out of school in order to work full time, which virtually guarantees that they will remain in the cycle of poverty and marginalization for the rest of their lives. SOY’s School Program offers literacy, math and computer skills training to participating youth. Some children have the opportunity to reenter the mainstream school system by passing an exam provided by the center. The school also offers recreational and creative activities such as art, theater and singing. Job-skills Training Program teaches boys how to sort and safely recycle plastic shampoo bottles. They receive a small income every month from sending these back to the shampoo factories. Through the process, children are taught the principles of recycling and the importance of safety precautions, such as suitable clothing, gloves, masks etc. Children also learn about hazardous waste materials, such as those from hospitals; they are encouraged to share this information with their families so that the entire community can learn. These boys also speak to their peers in Cairo schools about garbage collection, recycling and the environment.